You’re already used to seeing some awesome resource sites from me where you can get freebies and even earn money online, especially ones for bloggers, so it probably won’t surprise you that it’s time for another one, and apparently Dealspotr thought so too when they reached out to me last month about sharing my opinion on their site after being a member for a few months and earning a bit of Christmas cash myself. 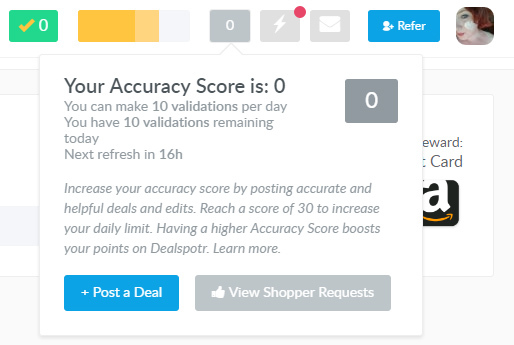 I earned my first $10 through Dealspotr within a week of joining – actually, in about 2 days. and it only took 3 days for that gift card to process! No long waiting periods. I’ve actually been a little really lazy with checking DealSpotr for the last few months, primarily because the deals that are posted there are so good, it’s hard to go there and not find something you want to get in on! FOMO anyone? That’s why Dealspotr is THE place to go find coupons, which can save you major bucks this holiday season for some last minute gifts (or maybe this is your normal shopping time, like me!). They statistically have more unique coupon codes submitted overall and per store, AND a significantly higher amount of verified and working deals than any of the other major online coupon databases. 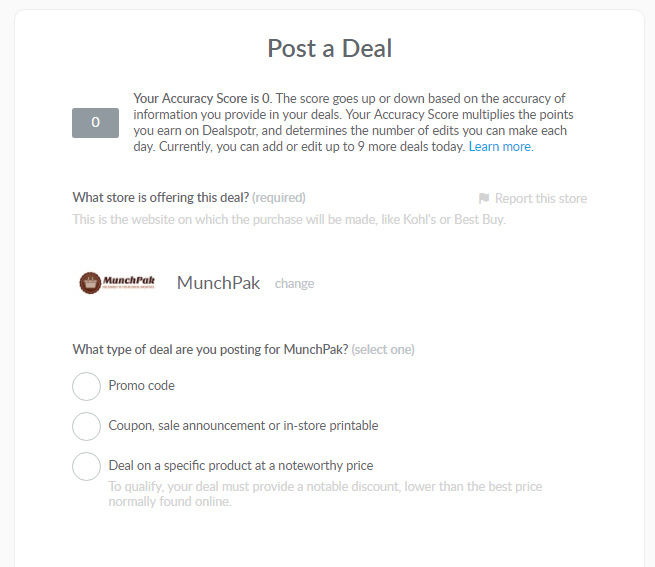 One of the major reasons they have more valid deals is because “spotters” have an accuracy score. Your accuracy score starts at 0 when you sign-up to the website, and every time you edit a deal (either by changing or verifying information about the deal, or by adding your own deal) your score will increase if the information is accurate. Accuracy includes if the deal is working as well as if the deal is described accurately, and a few other factors about the deal, and as your score goes up, you’re able to make more “edits” in a day and have your submissions be less watched, as you’ll have proven yourself trustworthy. This is what your accuracy score looks like at the base of 0. You can view your score at any time on the top bar, right after the yellow points progress bar. You can also view the menu and main navigation up in the top bar. In order (starting after the search bar) the icons are Menu, Daily Checklist, Points Progress, Accuracy Score, Notifications, Inbox, Refer, and your Profile. But you don’t have to be a “spotter” to use the site! You can just be a deal grabber and use it as your coupon & deal hub online. My favorite part of Dealspotr, besides that whole earning money tidbit, is that you can easily search for deal types from promo codes, to in-store deals, to freebies, and free-shipping. By separating out categories of deals it makes it easier to compare deals across retailers. Another major aspect of Dealspotr that makes it so different (besides earning money, we’re getting to that!) is that you can get a “feed” of deals. Dealspotr will show you relevant new deals and codes from your preferred retailers, categories, and the other users that you connect to. That means if you’ve got a bunch of beauty blogger friends like me, you’ll get an extra boost in the best beauty deals that your friends repost popping up into your feed. Speaking of beauty bloggers, all those personal coupon codes that brands give you for that 20% off? 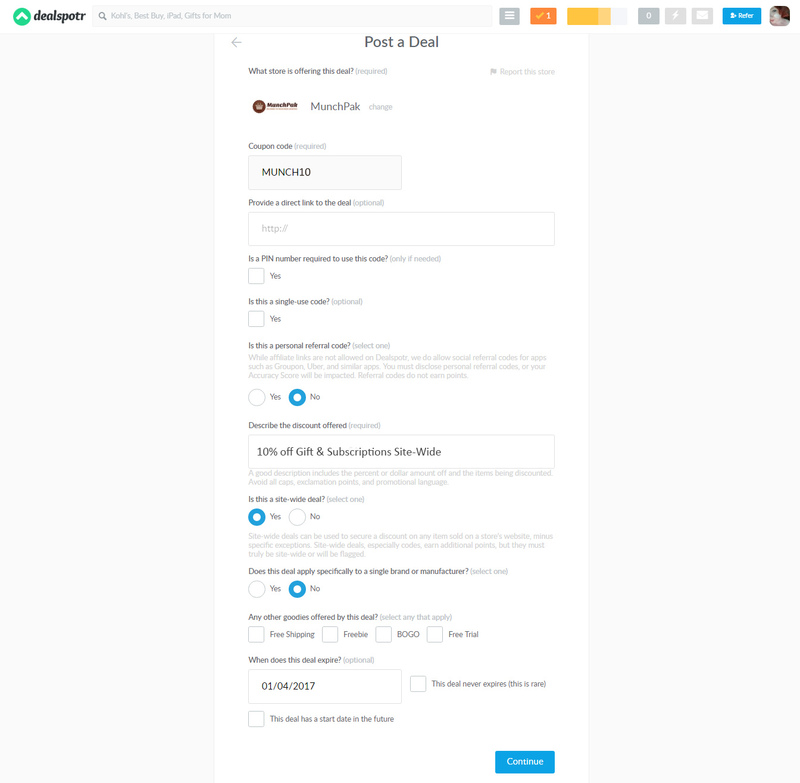 You can post them on Dealspotr! You can even post coupon codes you’ve created for your own business! 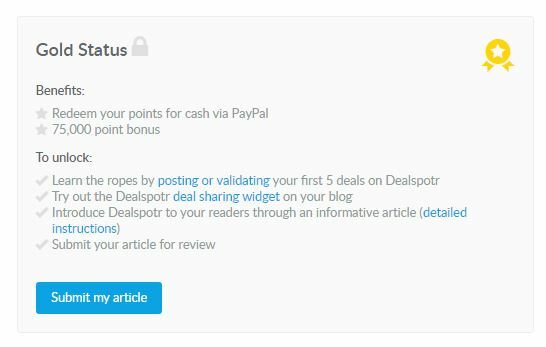 Just no affiliate links to earning cash on sites outside of Dealspotr – which is pretty fair, since almost everything you do on Dealspotr earns you points – and those points translate into money! I “spotted” my first deal today and earned 130 points. It took about 3 minutes. Here’s how easy it is to share your “spotting” and earn money! Step 1) I got an email I was subscribed to with a site-wide deal code. 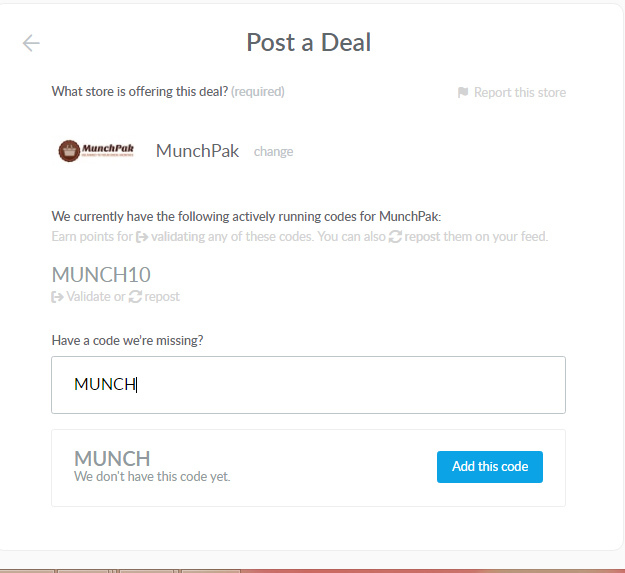 Step 2) Go to the site and test the deal code in the check-out page (and screenshot showing it applies). Search for the store name. Select the correct Deal Type. If you’re entering a Promo Code, it will search the database to see if they already have it. If they do, it will show as above, and instead of posting you can validate and repost. Flip through the rest of the options. More appear as you go depending on your selections. Be as accurate as possible, and make sure to be accurate and to the point in your deal title / description. Don’t forget the correct expiration date! After this page, you’ll have the opportunity to submit verification that the deal works. This is why you have the screenshot from earlier, and why Dealspotr is my favorite coupon site – there’s real evidence the codes worked! This was my verification screenshot for the MUNCH10 code. This is also where you can submit quick instructions or tips that will help users find where to enter the deal or notify them of any tricks to making it work. This is also how users can verify deals that they haven’t submitted, and add additional helpful information to help their fellow deal grabbers and spotters to use the codes effectively. And then you’re done! The deal is submitted, you earn your points! Typically in the first levels, your points can be redeemed for Amazon gift cards for $10 per 10,000 points (hello Christmas shopping! ), but once you reach Gold membership status, you can redeem your points at the same rate through Paypal. Here’s a look at the different levels: Bronze, Silver, and Gold. 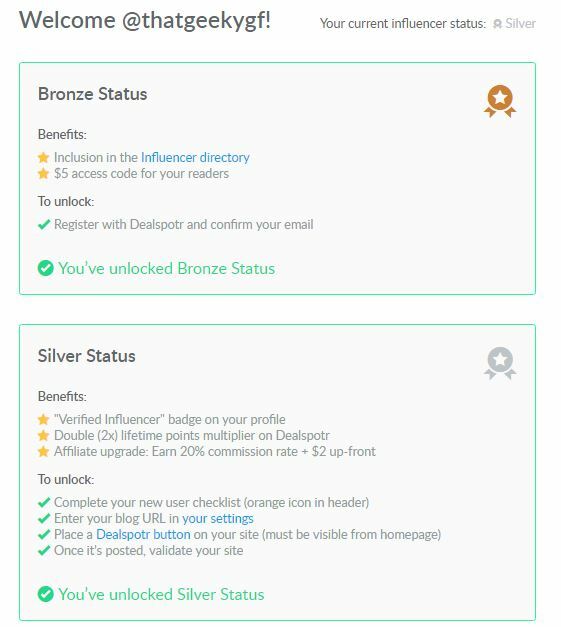 Silver Status is very easy to achieve in just a day or two, and is perfect for bloggers. Validating it takes no time at all and then you’re eligible to earn affiliate points from your referrals! Gold takes a little more work, but keep in mind that $10 / $10,000 points rate and it doesn’t seem like as much work for the reward. Psst, those informational articles look a lot like this one! Easy to do, fun to share, and you can even earn a little when you corrupt your fellow bloggers into earning holiday cash! You can Sign-Up for DealSpotr and earn an extra 5000 points ($5.00!) for using my referral. That’s on top of the $10 you’ll earn if you go for Silver Status! That’s already $15 free, besides any actual savings you do by using the site and scoring deals. If you missed it earlier, this is a sponsored post that contains affiliate links, but let’s be real, you already know I write these posts for all of my favorite resources, and it was bound to come sooner or later! 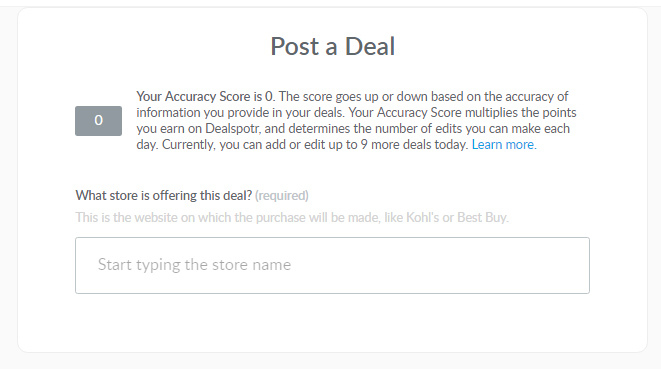 I’ve never heard of DealSpotr before. Is it an American thing? Sounds really cool and interesting. This is really cool! I have been looking for something like this for a while!